This Virus Is Making Dogs Sick Across The United States. Is Yours Next? A recent strain of the flu in dogs (H3N2) is highly contagious and acts similar to the flu found in humans. A simple internet search reveals the illness spreading across the United States. 100 dogs at a daycare in Washington became ill. There are several new cases in central Illinois, and some experts feel the virus has spread to as many as 4o other states. Your dogs can be infected with one of two viruses that cause the flu. H3N2 and H3N8. They both cause upper respiratory issues and in some instances can be fatal. H3N8 was first documented in the United States in 2004 and what’s odd is that this strain is closely related to a virus that affects horses. Scientist’s think that H3N8 mutated and now has a canine strain. H3N2, which is currently causing the epidemic across the U.S. seems to have originated in Asia from birds. There have been reported cases in Korea, China and Thailand. Experts are operating under the theory that the Avian Influenza (which is found in birds) somehow was transferred to dogs. The American Veterinary Medical Association says that dogs who fall ill with either strain o the flu fall into either the mild or severe category. There can be a cough that persists, reduced appetite and reduced energy. There could be sneezing and some eye/nose discharge. Severe cases include a high fever 104 degrees Fahrenheit or more. Breathing becomes a challenge and there is often a secondary bacterial infection that could help develop pneumonia. However, it’s important to note that most will only have sick symptoms for roughly 10 days. Keep your dog away from other dogs- Sounds simple enough, but it can be difficult especially if you folks go on walks or go to the dog park. If you must go to these places, make sure you’re pet stays away from strays and doesn’t come into contact with any other dogs that appear ill.
Wash your hands after touching other dogs- We know, it’s hard to resist those all those cute adorable pups out there. So wash your hands before going to touch your own dog. If you find it hard to remember to wash your hands, then abstain from touching other canines. Change your clothes after carrying other dogs- Canine Influenza can live on clothing for up to 24 hours. After your hugging session with those cute dogs, change them before you go and hug your own. Disinfect the area- If there is another dog that has come in contact with your house, other toys, etc you can disinfect the area and keep it away from your dog for a few days. This is important as canine influenza can live on hard surfaces up to 48 hours. Call ahead of time- If your dog has an appointment to be boarded, groomed or in doggy daycare it’s important that you call and ask if they have had any incidences of dogs getting sick. That way you can determine if it is still safe for you take your pet there. 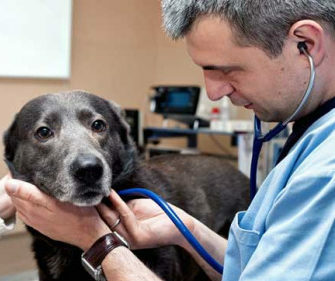 Take them to the vet- If you’re dog is looking ill or exhibiting some symptoms, then take them to the vet immediately. Has your dog every battled with the flu? If so, what did you do? Comment below and don’t forget to share! ← High Ranking Church Official Says That Heaven Is Full Of…Pets?